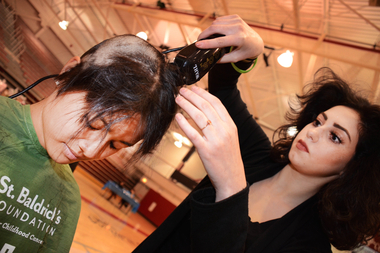 Malak Elshafei, a student with Mario Tricoci School, shaves the head of St. Xavier student Mallorie Rosales. Rosales had more than 20 inches of hair shaved. MOUNT GREENWOOD — Raising money to fight childhood cancer might be the best excuse to get out of studying for finals ever. Saint Xavier University students Anne Costello and Mallorie Rosales had that in their back pocket after coordinating a fundraiser for the St. Baldrick's Foundation on Thursday night. Costello, a junior majoring in psychology, and Mallorie Rosales, a nursing major, raised $12,913 for the foundation dedicated to funding pediatric cancer research. "I'm not the brave one, the little kids with cancer are," said Rosales, as Malak Elshafei, a student with Mario Tricoci School, shaved off 20 inches of her hair. This was the first St. Baldrick's event at Saint Xavier in Mount Greenwood. More than 35 students and employees agreed to shave their heads as both a show of solidarity with children battling cancer as well as for pledges. The fundraiser at the university's Shannon Center drew a total of 58 volunteers. Donations can still be made by visiting Saint Xavier webpage on the St. Baldrick's website.